Katy Waller, 33, a partner in her family’s business, Blaze Farm, Wildboarclough near Macclesfield, is this year’s winner of the £2,000 John Platt Travel Scholarship. She is responsible for making the farm’s ‘Hilly Billy’ range of ice creams and also manages the tea rooms, open farm educational days and nature trails. Katy is planning to use the scholarship to attend the Great Lakes Ice Cream and Fast Food Trade Show in Lansing, North America, which is the largest annual show in the world catering for ice cream operators. She also intends to attend management courses in Europe and in the UK. She received the award during the President’s Lunch from John Platt OBE, who retired two years ago after 30 years as chair of the Cheshire Agricultural Society, and from Meredydd David, Principal of Reaseheath College, which organises the scholarship. Katy said: "Being awarded the John Platt Scholarship has given me a fantastic opportunity to mingle with professionals over the pond and to gain an insight into how they run their operations. I’m particularly hoping to pick up tips on how to increase profit by cutting down on utility costs and to see if there are any new flavours I could introduce into my own range." Blaze Farm is a mixed hill farm which diversified into tourism in 2002. The business won the Best Small Visitor Attraction Award in Cheshire and Warrington in 2004 and in 2008 was the winner of Natural England’s Future of Farming Award, north west region. Katy has introduced 17 flavours into her ice cream range, the most unusual of which is Turkish delight with white choc chip. She uses the milk from the family’s black and white dairy herd. Katy, of Waggs Road, Congleton, is a partner in the business alongside her parents, Florence and Harold Waller, and her brother Marshall. 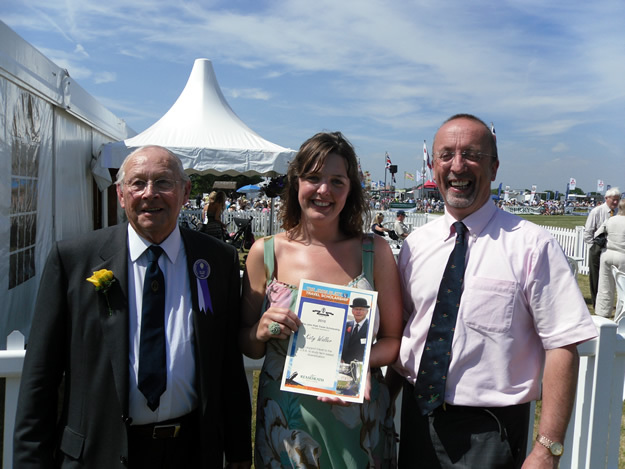 She is a former chairlady of Macclesfield Young Farmers and is a past Cheshire county YF chairlady. Last year’s winners of the John Platt Travel Scholarship were Jonny Hewitt and Ian McGrath. Jonny, who is Director of Fun and Chaos at Red House Farm, Dunham Massey, and is Cheshire county chairman of the NFU, studied farm based diversification in Philadelphia, USA. Ian, of Parkgate Farm, Tabley, Knutsford, plans to visit Holland and Sweden to look at advancements in dairy farming. The John Platt Scholarship is open to anyone aged between 18 and 35 who lives or works in Cheshire and is employed in agriculture or related industries. Applicants must show that they want to improve their education and experience through travel by putting forward a project focused on new technology, new or alternative farming methods, diversification, use of natural resources or improved profitability. John Platt is chair of governors at Reaseheath College, Nantwich, and the scholarship is organised through the college. Applications are being taken for next year.